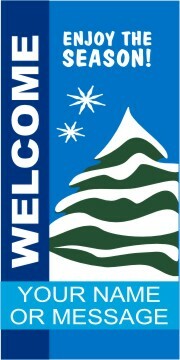 Price: Double-side dye-printed banner, size 24"X48" available for your winter light pole display. Several designs available.$88.00 ea. Winter Collection: We have designed a series of light-pole banners that are affordable, colorful and very strong. Polyester Fabric Banner made of 200 denier Dacron polester dye-printed with colorfast dye-sublimation ink for long life and color brllliance. Double-side construction. Two prints are made and sewn together for visibility on both sides. Banners have a 3" pole hem on top and bottom with leather tabs sewn into the pole hem to facilitate easy attachment to banner arm poles of mounting set.